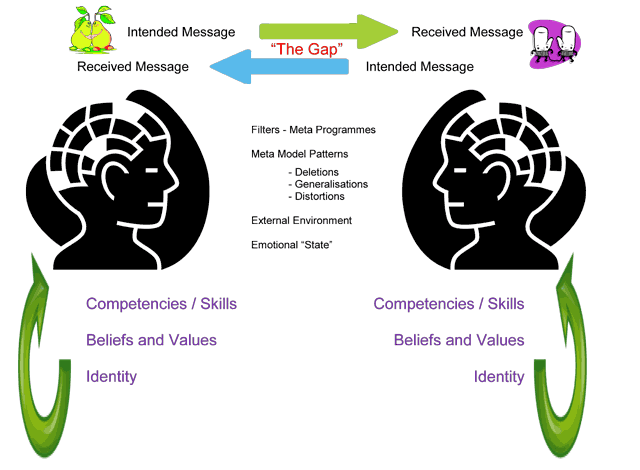 Purpose: This diagram illustrates the “Gap” that may exist between any two participants in a dialogue. This gap is created (usually unintentionally) through the various influences that may be operating at any one time or in a given context, combined with the behavioural and attitudinal consequences of our respective histories. As will be explored in more detail later, each party comes to any communications situation with a vast range of possible influences acting upon them, both consciously and unconsciously. This means that we will almost certainly experience any given situation differently to each other. Therefore, the more aware we are of our own perceptual filters, the more likely we are to minimise the risks associated with a gap beginning to develop between what was intended and what was received (interpreted) by the other party. Furthermore, if we can truly enter a world within which feedback is treated as potentially useful (neutral) information rather than inherently ‘positive’ or ‘negative’, we can use every situation, however challenging it becomes, as a developmental opportunity.